Sometimes you’re just hungry, aren’t you. Not just hungry but, like, HUUNNGGRRYYY. And those are the times when you (I) start rifling through the cupboards and start eating baking ingredients. So, because it’s day 6 of #100healthydays i decided to pre-empt this unfortunate reflex by having a hearty lunch. I adapted this recipe from the BBC Food website which you can find here. Instead of the 2 tablespoons of sunflower oil I used 2 teaspoons of coconut oil and I added Ballymaloe Jalapeno Pepper Relish. Fresh coriander and chili pepper from the garden! I ate two of these gorgeous burgers for lunch and I’m so glad I did because I wound up not having a chance to eat again for another 7 hours. My body is not use to such famine! 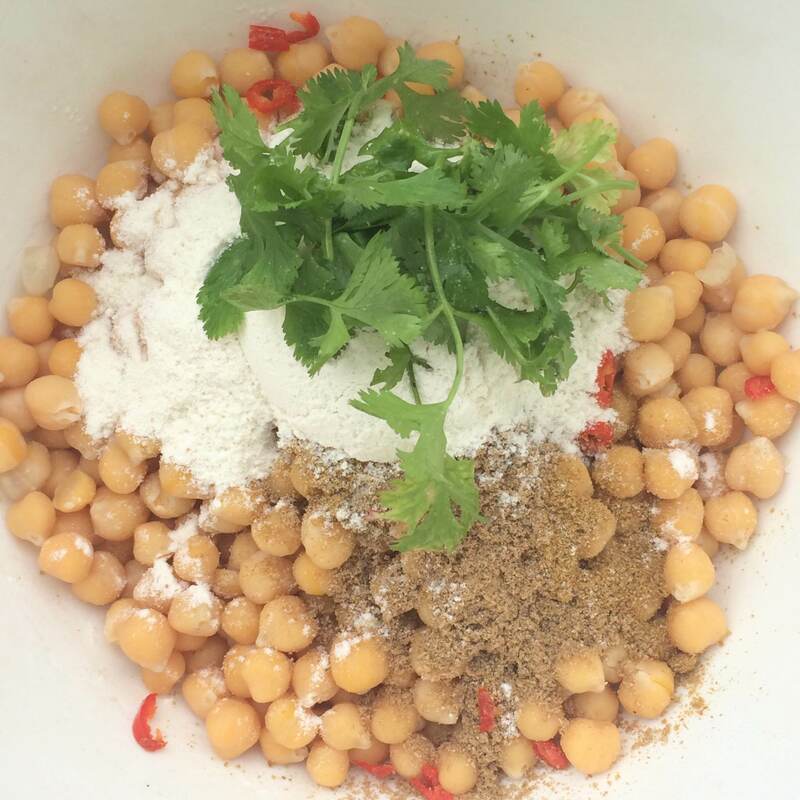 The protein and fiber in the chickpeas must have really done the trick. This recipe is definitely a keeper and it barely cost anything! The coriander and fresh chili I used came from my garden, the cherry tomatoes and organic cucumber were ends of boxes and the brown pittas were on the cusp of expiry (tomorrow is shopping day.) 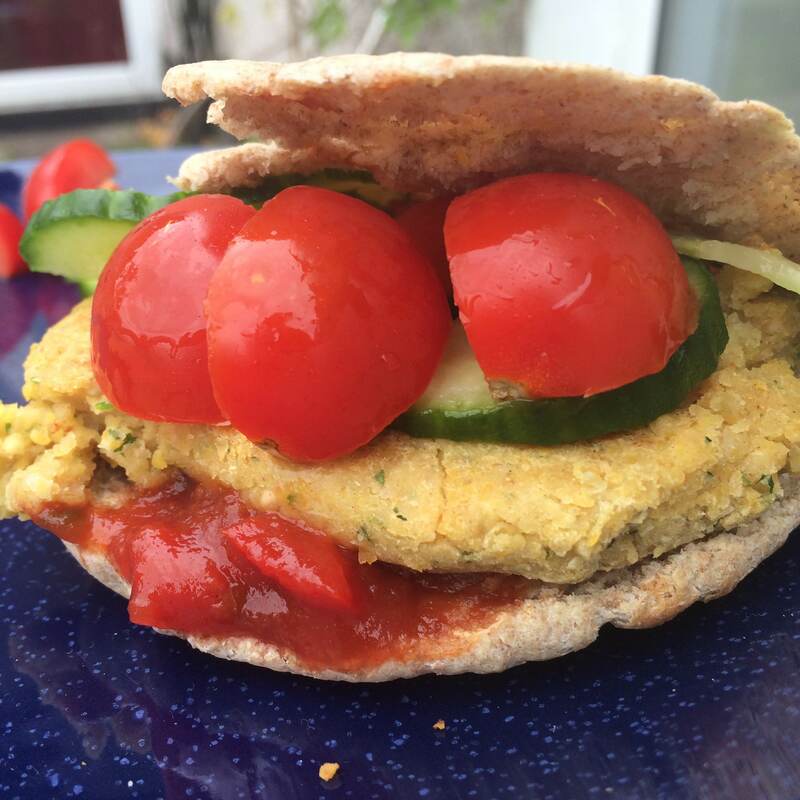 I had used dried chickpeas, too, so they were extra-thrifty! 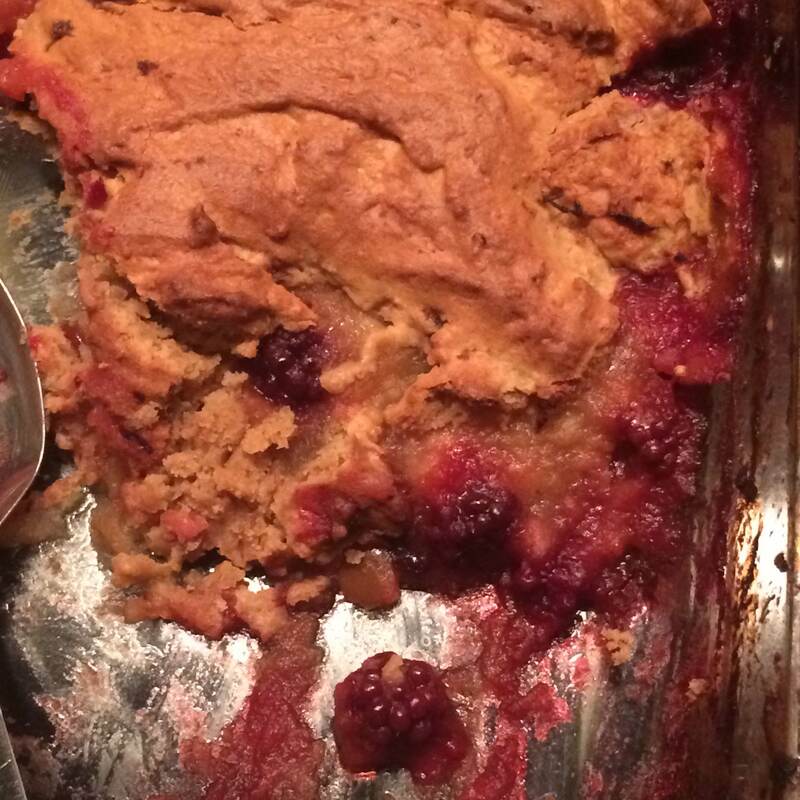 After a salmon and vegetable dinner, I prepared a blackberry apple sponge pudding which was possibly the most delicious thing I have ever created. I used dark muscovado sugar which gave it the most incredible deep, rich caramel-apple flavour! 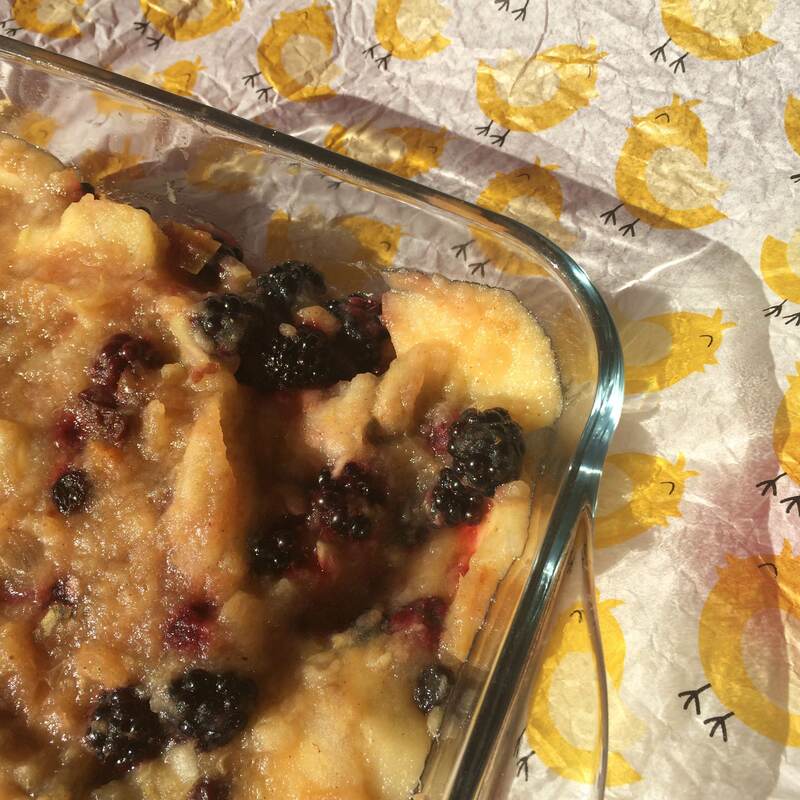 Keeping the blackberries aside, combine the rest of the filling ingredients in a pan and stew on a gentle heat until the apples soften adding a little water to stop burning if necessary. When the ingredients have softened transfer to an ovenproof dish and stir in the blackberries. In a separate bowl cream the butter and sugar together. Add the egg and a dash of your choice of milk and beat until combined, adding a spoon of flour if necessary to prevent curdling. 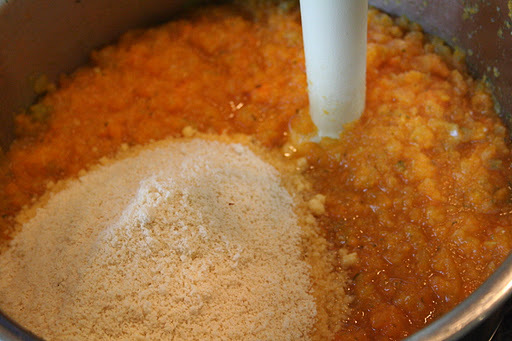 Finally, add the rest of the flour and mix until smooth, being careful not to over beat the batter. Cover the filling with the sponge batter and spread carefully over the top. Bake at 180 degrees Celsius for 25 minutes or until the sponge is cooked through. 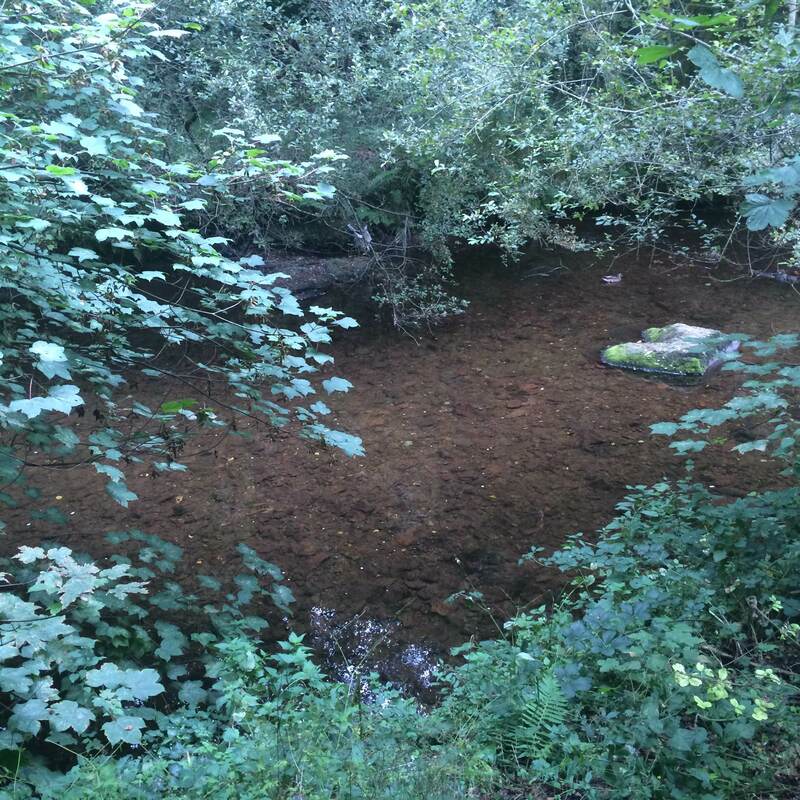 Enjoyed a river view on my outing! 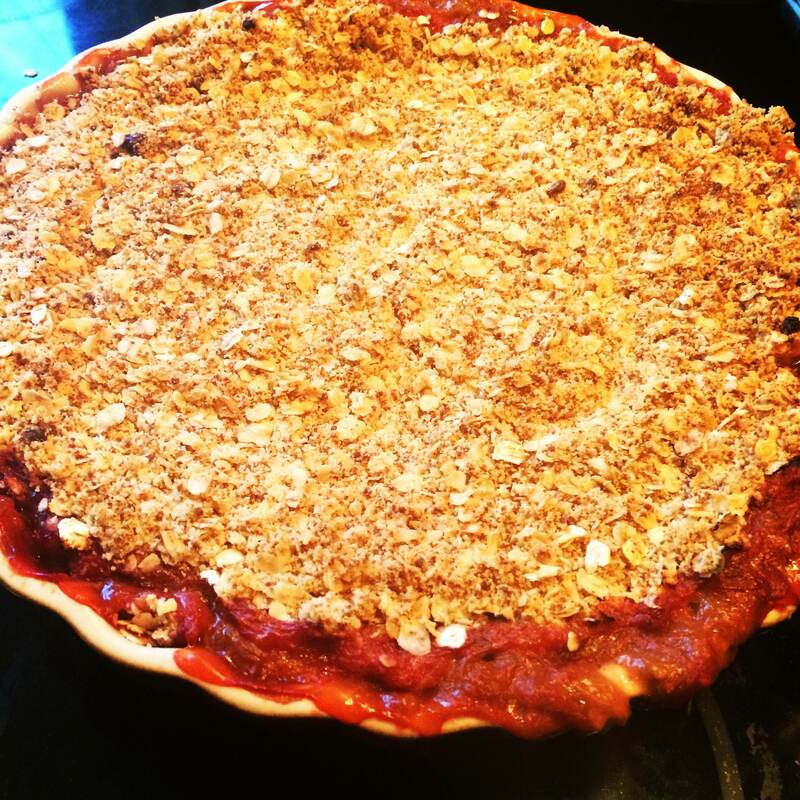 Healthy Days – Rhubarb challenge! Today I had to figure out how to use up a bunch of rhubarb while still making healthy choices. The problem being that generally rhubarb needs a ton of sugar to make it palatable. I decided to use strawberries and cinnamon to sweeten the filling and to drastically reduce the sugar in the topping. Homemade and warm from the oven – and lower in sugar! 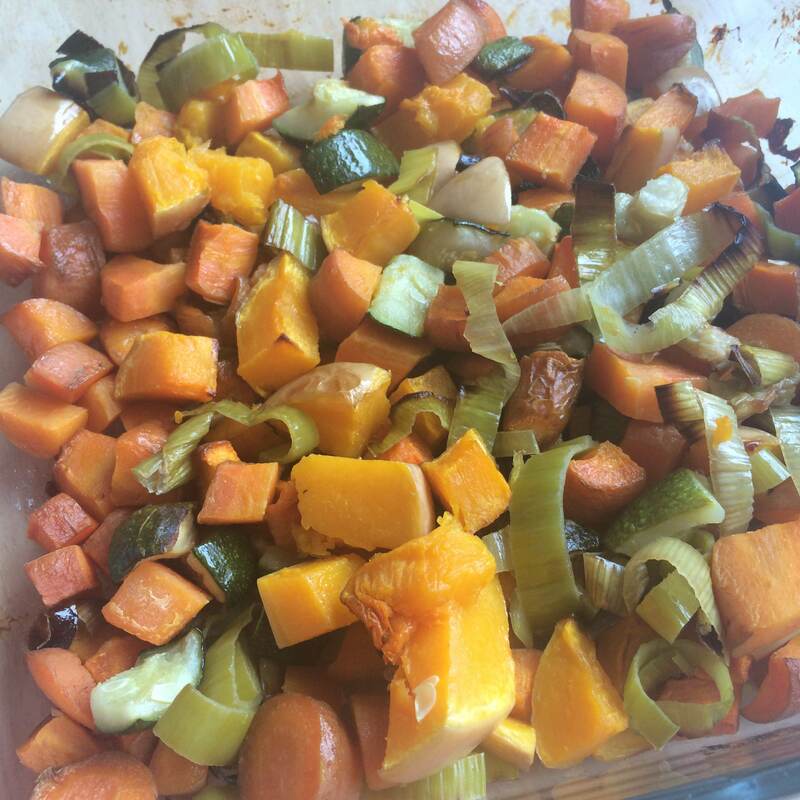 Simply stew the filling ingredients together until the fruit has softened. Transfer this filling to an ovenproof dish. Blitz the flour, butter and sugar together until breadcrumb-like in appearance. Stir in the oats. 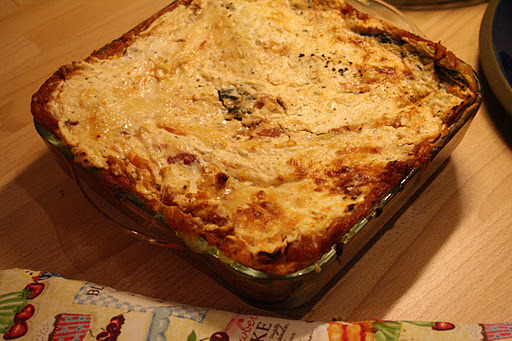 Cover the filling with this topping and bake for approximately 30 minutes at 180C. I’ve been thinking a bit about the other elements to this project that I need to tackle. For one thing, I need to learn to turn out the light early and just go to sleep! No Tumblr or Facebook last thing at night. I think being responsible at bedtime will be very important for gaining more energy, fighting off winter bugs and keeping my appetite under control! Aside from that, I’ve booked in with an osteopath for the pains in my neck, side and knee that have been plaguing me for a while (…9 months…) I’m looking forward to getting it dealt with! Today met with my friend Áine for lunch/coffee in town. I decided to eat at home and just have a juice and a coffee when out to try to optimise my healthy eating potential! -Homemade roast vegetable soup, two slices of seeded rye toast. -Beetroot, raspberry and orange juice and a skinny cappuccino. Brazil nuts. -Veggie spanish omlette with rhubarb and strawberry crumble with a tablespoon of creme fraichefor dessert! Roasting a selection of vegetables left over from yesterday’s dinner for soup. 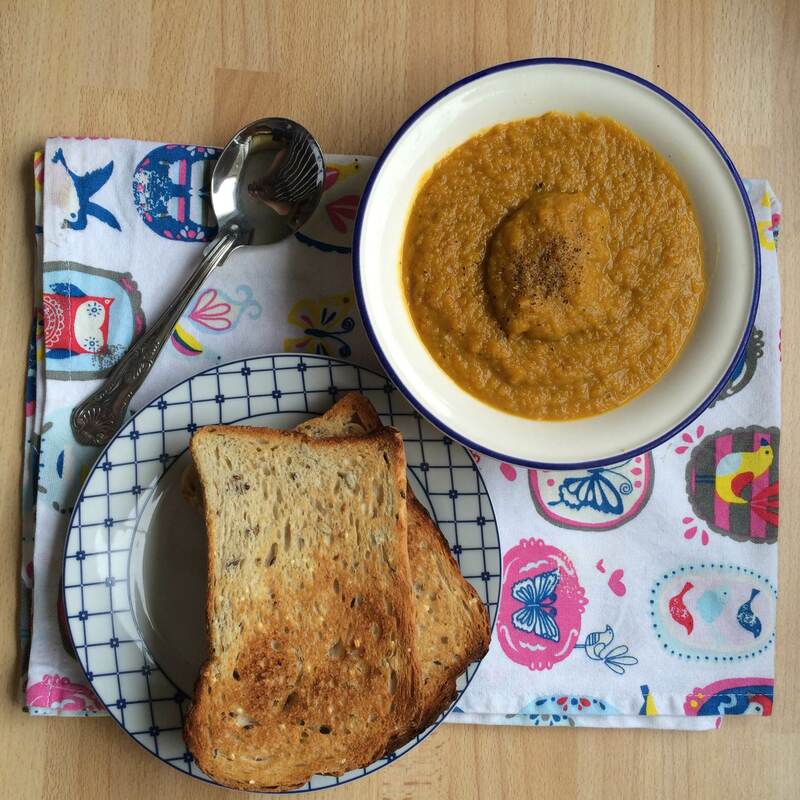 Nothing beats hearty, thick soup on a rainy autumnal day! Wilton Farmer’s Market – Tasty Goodness. Healthy Things. 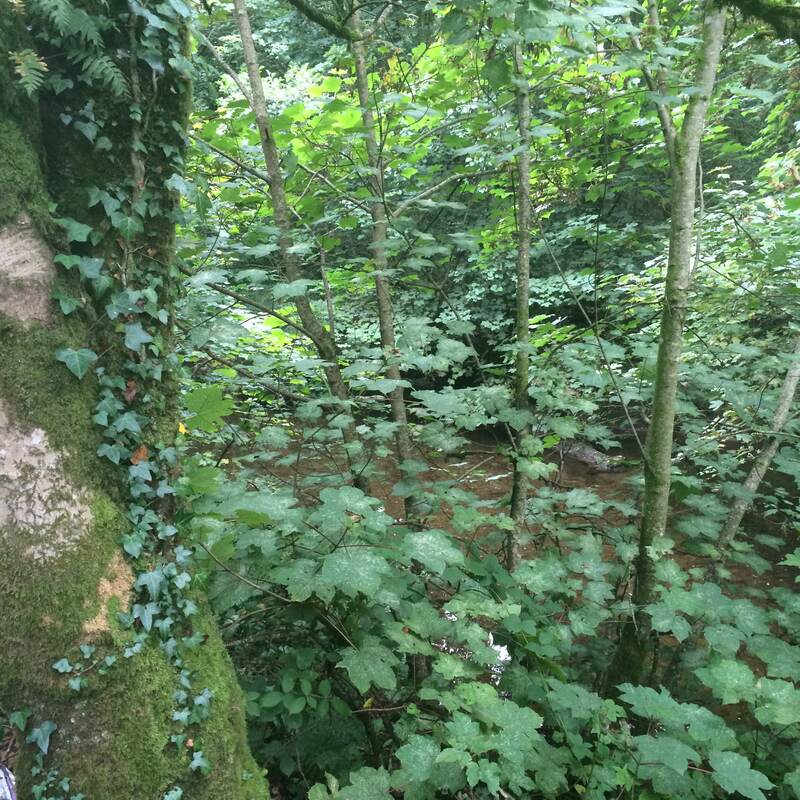 If there’s one thing that can be said with certainty it’s that Cork people love good food. It may be tempting to simply brush off farmers markets as a fad, somewhere that only wealthy hipsters can afford to shop but that is no longer the case. A variety of coffee and cake stands, sandwich and pizza stalls mean that you no longer have to worry about feeling obliged to buy a ton of expensive things you didn’t want. Take Wilton Farmer’s Market, for example. Every Tuesday from 10:30am – 2:30pm an array of colourful stalls pop up in the car park of Wilton Shopping Centre. Not only does the market feature locally grown organic vegetable from near Inch in Co. Cork and imported organic fruit and nuts courtesy of Organic Republic but while you mill around you might also grab a handmade marshmallow from Cloud Confectionary or a coffee from local favourite (ok… MY favourite) Badger and Dodo. The market provides a table and chairs for nibblers so that you can take in all the sights, sounds and smells of the other food producers. 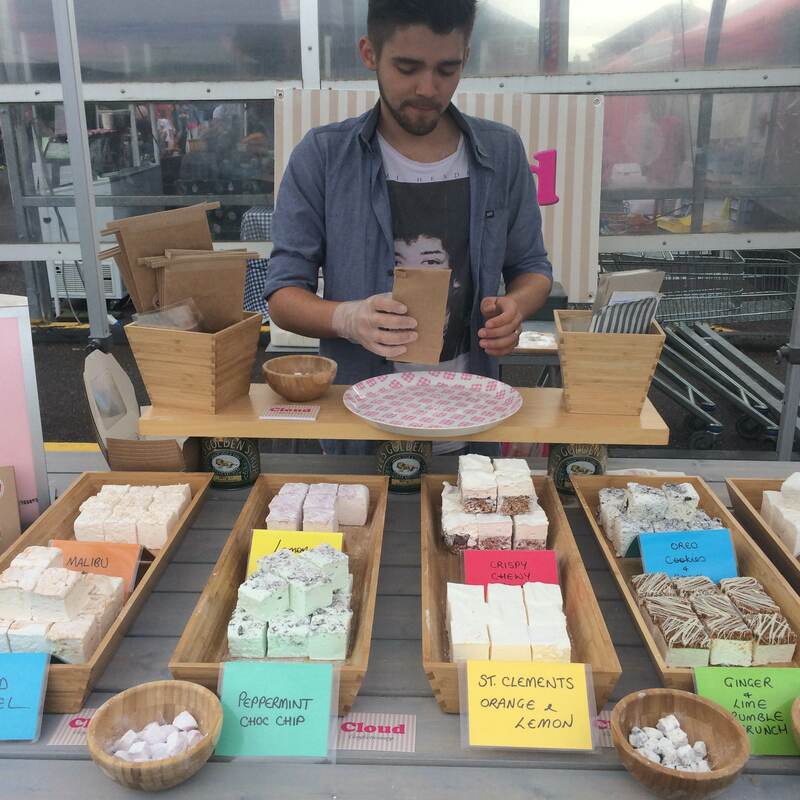 A delightful display of fabulously flavoured marshmallows by Cloud Confectionary! One of my favourite companies to buy from is Arbutus Bread. 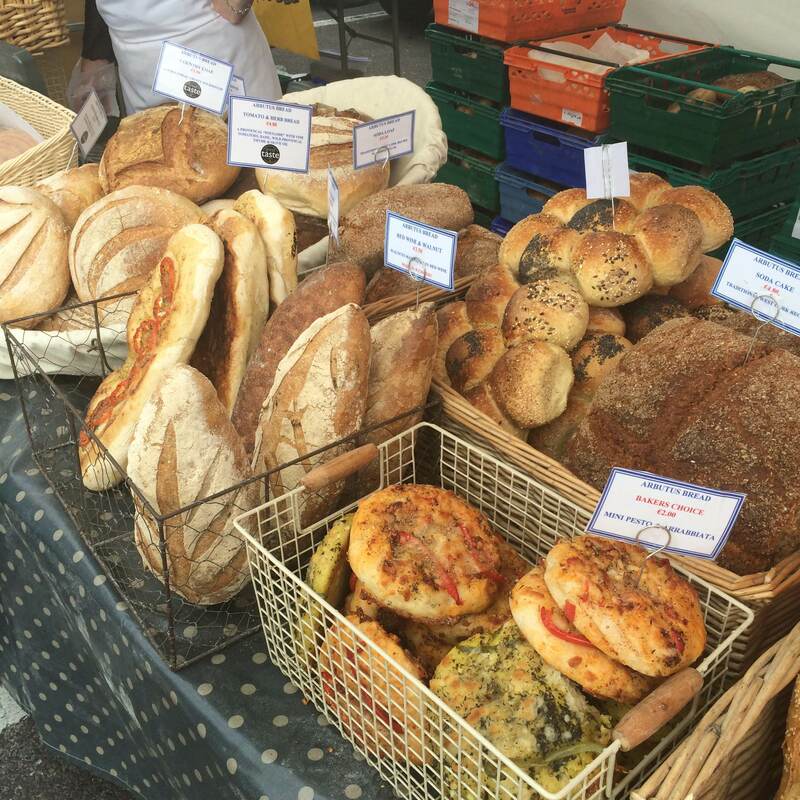 Not only does this artisan company produce an impressive range of unusual and traditional freshly baked breads, you will always receive helpful information on how to get the most out of your loaf. This morning I purchased a loaf of Latvian rye bread. The lady behind the sea of bread informed me about the contents of the bread (low in gluten!) but also about the baker who made it and how best to serve and preserve it. Her expert knowledge means that I know which breads are best to freeze and which are best eaten quickly. 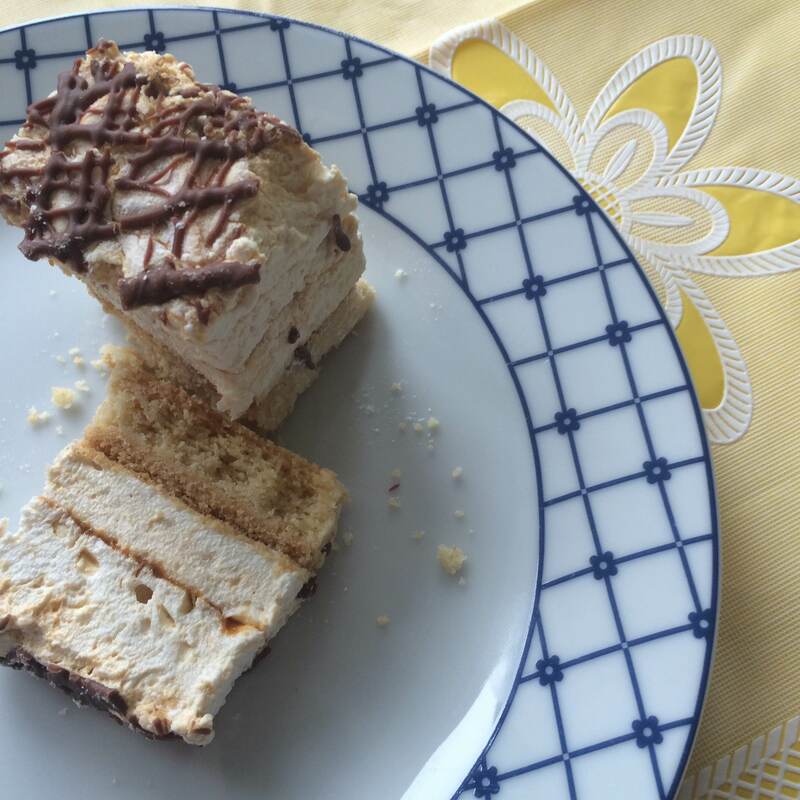 My reward for such diligent marketing – a caramel shortbread marshmallow! As well as the steady favourites of Volcano Wood-Fired Pizza, The Beanie Brownie Company, The Rocket Man Salads, My Goodness raw and vegan foods and The Golden Bean (to name but a few) there is also a guest slot that changes weekly. What is really great about farmers’ markets is that it gives you a chance to see what is going on in your area. There are small food companies taking off all around us and these markets give us a unique opportunity to sample things first and support new businesses. After my first visit to Wilton this morning I will definitely be returning, and I do hope that it continues to grow! 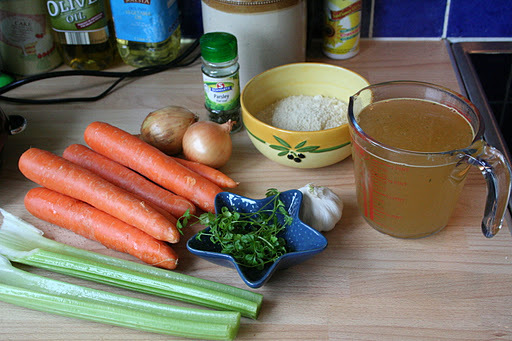 This is my favourite soup recipe which I’m posting for Laura. It comes from Gillian McKeith’s cookbook “You Are What You Eat,” which, actually, there is no point in buying because it only has about three good recipes in it. Though I must admit that those three recipes are AWESOME! 1. 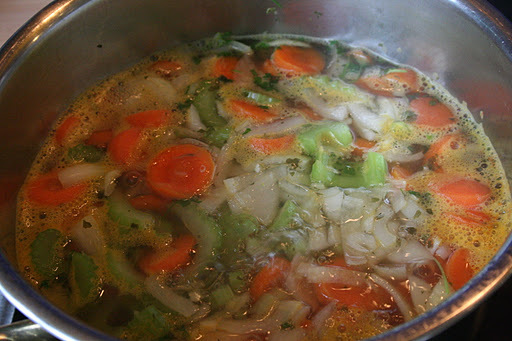 Place the onions, garlic, carrot and celery in a large saucepan. Add 1.25 litres boiling water and the bouillon powder. Bring to the boil and add the herbs. 2. 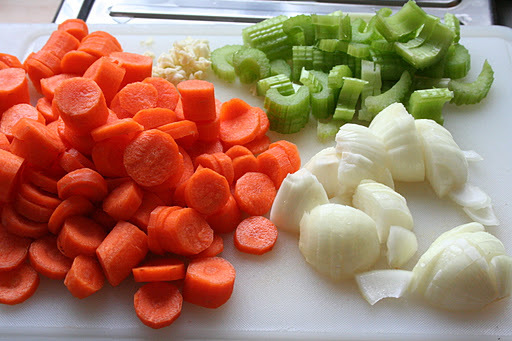 Lower the heat and simmer for 20 minutes until vegetables are tender when pierced with a knife. 3.Remove from the heat and allow to cool slightly. Strain, reserving the stock. 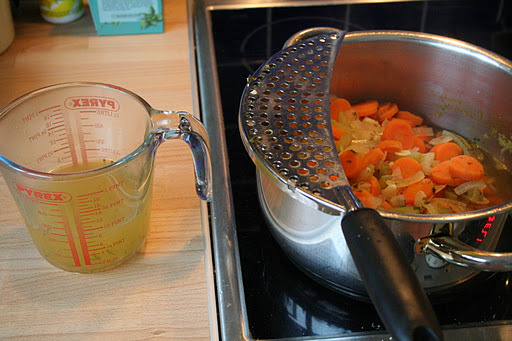 Blend the vegetables with a hand held blender until smooth. 4.Return the mixture to the pan and add the ground almonds and enough of the reserved stock to make a soup-like consistency. Reheat, then divide between warmed soup bowls and serve garnished with chopped fresh coriander and parsley. 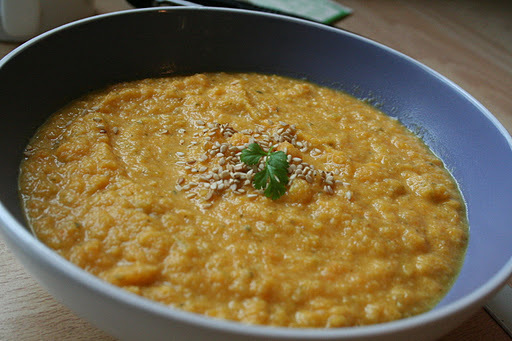 Though the original recipe asks for chunks of pumpkin to be lightly fried, I used my purée instead. 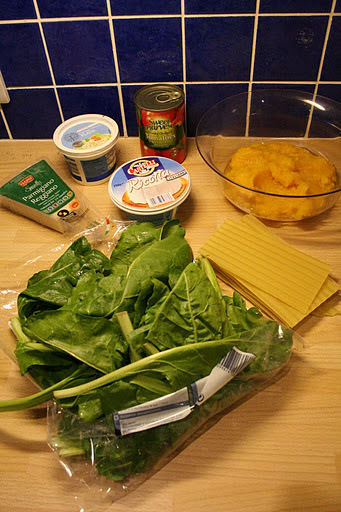 I also used adult spinach instead of baby spinach, removing the stalks and wilting it before adding the pumpkin. 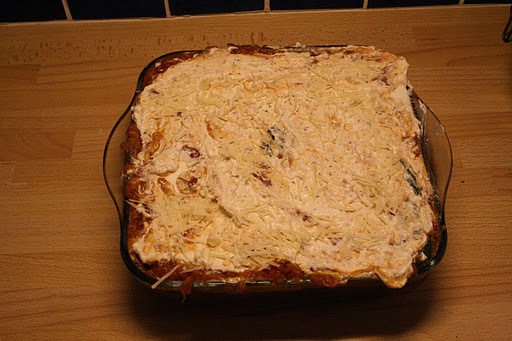 The recipe also called for 350g of fresh lasagne but I used dried and I only needed five sheets! Very low in carbohydrates. 🙂 (Also low in fat, salts and saturates as well as high in calcium and iron.) How many sheets of pasta you need will depend on the size and shape of your oven proof dish. 1. Preheat oven to 200°C/ fan 18O°C/gas 6. 2. Spray a frying pan a few times with the cooking oil. 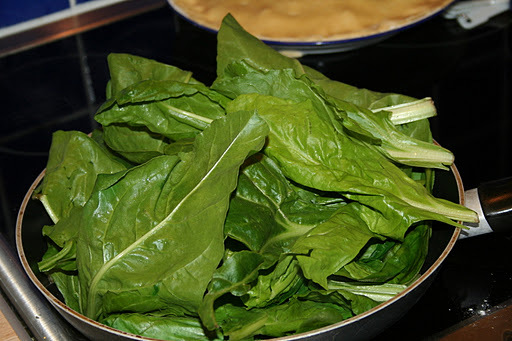 Add the spinach, a third at a time and wilt over a low heat, stirring frequently. 3. 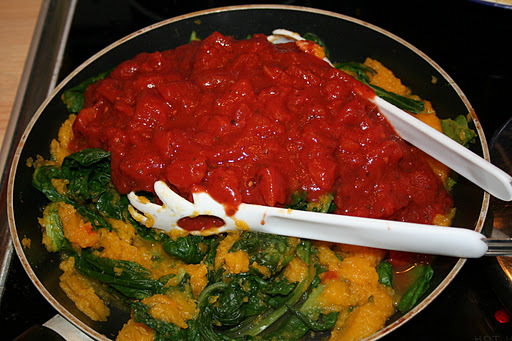 Add the pumpkin, garlic and tins of tomatoes to the spinach and cook over a medium heat for five minutes. 4. 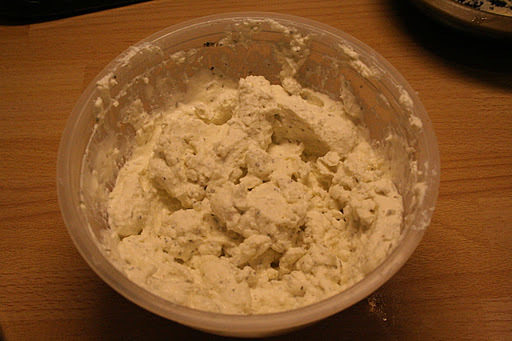 Add the ricotta, cottage cheese, two thirds of the parmesan and dried herbs together and blend in a food processor or with a handheld blender until it makes a smooth paste. 5. Pour one third of the tomato into an ovenproof dish. 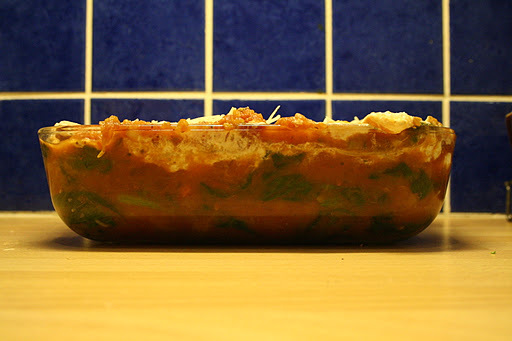 Add a layer of lasagne, followed by more tomato sauce and a layer of the cheesy sauce. * Repeat these layers until the ingredients are used up and finish with the cheese sauce. Sprinkle with the remaining parmesan and bake for 30 – 40 minutes.